The opening night of the Cranes Combined Carrick Speedway will see the opening round of the Banjos Bakery and Cafe, Tasmanian Street Stock Series which has attracted 21 entries. The twelve round series will be scattered throughout the Tasmanian season, with drivers only becoming eligible one competing at a round of the series at all three of the Tasmanian venues. 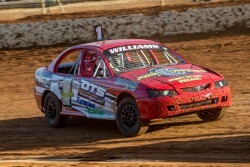 Amongst the strong field will be the usual seasons campaigners, Corey Bauld, Matt Hammond, Luke Williams, Dale Riley Jnr and Matthew Atkinson to name a few, along with several new drivers to the Street Stock ranks. It will be a busy start to the season for the Street Stock drivers, with the first three weeks of the season, being a part of the series, with round two at Latrobe and round three at Hobart before the end of the month. Racing on Saturday night commences at 5.00pm EDST with events also for Junior Sedans and Modified Sedans.